On Today’s Show: Petersen Automobile Museum Sells Classic Cars; Can ‘Chain Reaction’ be Saved? The Petersen Automotive Museum is changing gear with a bold redesign by Eugene Kohn. But critics say it is funding the effort through the sale of some priceless cars. With Leon Kaplan, Eugene Kohn, Terry Karges, Jerry Hirsch, David Undercoffler. Santa Monica’s anti-nuclear Chain Reaction needs funds to avoid a meltdown. Lisa Napoli reports on the secret benefactor who originally made the sculpture possible. 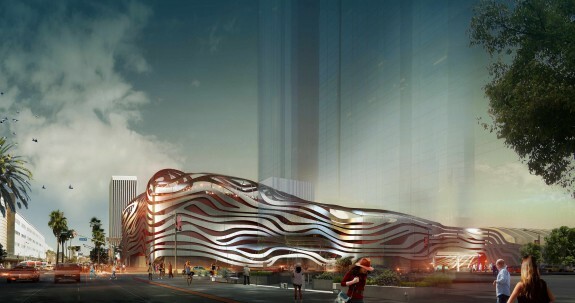 On last week’s DnA we heard from Terry Karges, executive director of the Petersen Automotive Museum, about the dramatic redesign they are planning. Now we are following up with a look at the sales of collectibles cars that are part of the story. 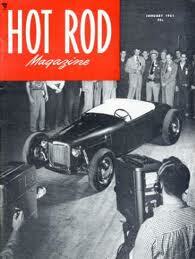 Almost 20 years ago the founder of Hot Rod magazine, Robert E. Petersen, created a museum to cars. Now Robert Petersen is gone, and the museum’s current management is ringing in some big changes. At the recent Pebble Beach Concours d’Elegance they announced plans for a dramatic overhaul of the building, jazzing up its rather dark interior, creating more exciting installations, and wrapping the building in undulating “ribbons” of steel. The architect is Eugene Kohn, of the New York firm Kohn Pedersen Fox, and he talks about how the design is intended to capture in its imagery the “speed, elegance, motion and power” of gorgeous cars, particularly “French cars with Italian bodies” of the 1930s. But the excitement at the new plans have been somewhat tempered by stories that circulated about the sale of some of the Petersen’s classic cars. Jerry Hirsch, automotive business reporter for the Los Angeles Times, set off a firestorm when he reported that “the Petersen is quite under the radar selling off 100+ of its vehicles” in order to finance capital construction, in what he describes as a breach of its public trust. Moreover, he reports that the museum is trading popular American cars so as to shift the focus of the museum onto French Art Deco vehicles – Voisins — owned by the museum’s Board Chairman, Peter Mullins. He also says the nine million dollars worth of cars that have been sold includes important a 2006 Bugatti Veyron and cultural icons like a Duesenberg that belonged to African American dancer and actor Bill Bojangles Robinson; ownership of such a car signaled the success of an African American man at a time of deep racial inequality. The museum rejects the charges, saying a founder’s car museum differs in its rules from an art museum and that everything they are doing is above board, ethical and approved of by the car enthusiasts that make up their board and supporters. Karges says that it is no problem to sell off cars from its 400+ collection because if ever they need access to one for an exhibit, it can be easily gotten on loan. 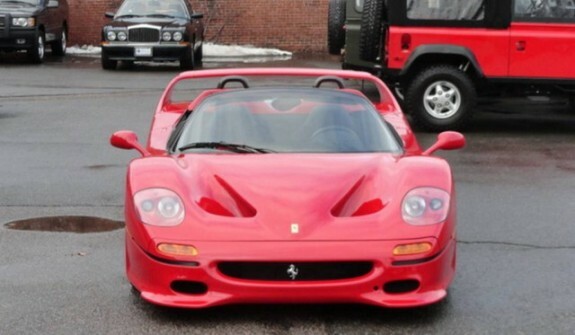 David Undercoffler, the auto writer for the Los Angeles Times, bemoans the sale of the cars, especially two classic Ferraris, a 1995 F50 (image below from World Car Fans) and a 1990 F40. But Leon Kaplan, KABC’s “The Motorman,” a car restorer and friend of Robert Petersen, recalls purchasing that F50 on behalf of Petersen and says that like many cars in the collection, it sat in the basement vault, gathering dust, and ratcheting up high maintenance costs, and is better off being sold. 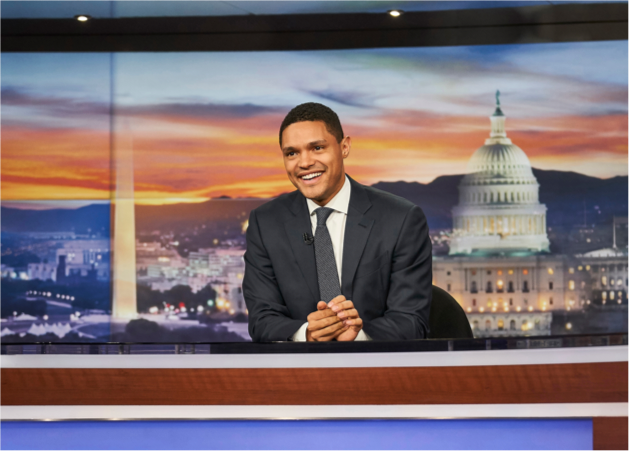 He says that a 1957 Plymouth Fury once bought by Robert Peterson sat downstairs, out of sight of the public, for more than ten years. Ironically, it is in this basement vault, according to David Undercoffler, that the museum’s real action is. For an extra $25 you can have a tour of the vault and see cars with “great back stories:” a Mercedes that once belonged to Saddam Hussein, cars that once belonged to Steve McQueen, and much more. 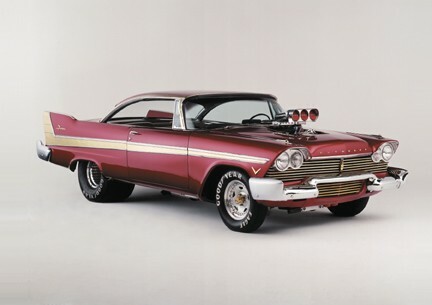 <!-- missing image http://blogs.kcrw.com/dna/wp-content/uploads/2013/08/1957-Plymouth-Fury-300x211.jpg -->Plans for the Petersen Automotive Museum do not involve scrapping the vault tour, they say, and they do not involve changing the focus of the museum — as charged by Jerry Hirsch — from American cars to French Art Deco. Rather says, Leon Kaplan, the role of the Petersen is to embrace global car culture while maintaining a focus on Socal car culture. He hopes that the museum will be constantly changing and wide-ranging in its exhibits, unlike the Ford Museum where, he says, once you’ve been once you don’t want to go again. David Undercoffler concludes by saying that despite the concerns raised by his newspaper, he is generally excited to see changes at the Peterson, whose space and installations are, in his view, currently less exciting than many of the cars on show. 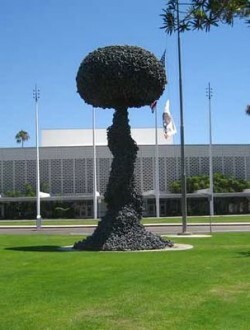 A twenty-six foot tall sculpture of a mushroom cloud sits in front of Santa Monica Civic Center. It was created by the late LA Times cartoonist Paul Conrad. It is called Chain Reaction (seen in picture right, from Daughter Number Three) and it needs a structural restoration that’ll cost hundreds of thousands of dollars. KCRW’s Lisa Napoli says raising the necessary money might not be an issue if its original patron were still around, a patron whose name was a closely guarded secret for decades. But now the secret’s out. . . the late Joan Kroc. Not content with his success in one medium, Paul Conrad took to making sculptures. Some were religious in nature (Conrad was a devout Catholic). Others depicted political figures, small bronzes that packed a similar punch as his one-dimensional art. When she approached Paul Conrad at a talk he gave, he didn’t know who she was. Eventually, the two became close friends, and Conrad and his wife Kay even vacationed with the heiress. It was likely on a yacht trip that the subject of Chain Reaction came up. Kay Conrad is almost 85 now. She doesn’t remember for sure, but she does know the family was sworn to secrecy about who was funding the proposed sculpture. It seemed a slam-dunk pairing: An acclaimed artist arriving at the Santa Monica City Council with the necessary $250,000 to make it a reality. 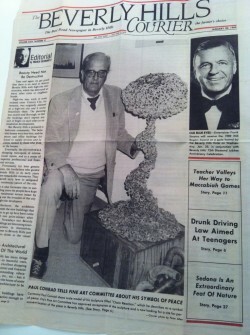 Not everyone was so keen to have a 26 foot tall mushroom cloud installed in Santa Monica. There was so much back and forth that at one point Conrad took the idea to Beverly Hills. Ultimately, they rejected it. Eventually, the massive artwork did find a home in Santa Monica’s civic center, but not till four years after Conrad initially proposed it. Now, after over 20 years of bathing in the salty ocean air, the public art piece called Chain Reaction is in the cross-hairs: the city wants to tear it down, claiming that it’s a safety hazard–that to fix it would cost more than it did to build. Activists want to preserve it, both because of its cultural significance and because, they say, the threat of nuclear war is no less great than it was when the piece was erected back in 1991. 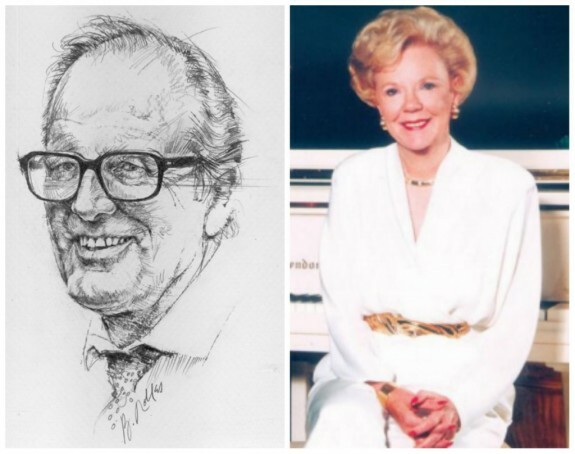 Today, on what would have been the 85th birthday of Joan Kroc (August 27, 1928), and with five months to go before the fate of the work is sealed, it seems a good time to look at the curious back story.